We are a leading Manufacturer of circular panel saw, scm panel saw, sliding table panel saw and sliding panel saws from Ahmedabad, India. Our firm delivers precisely tested and a high-grade assortment of Circular Panel Saw. Sturdily built heavy duty machine to suit Indian working condition for a precise cut with burr free cutting. Lifting and tilting of saw unit by means of hand wheels on the machine both on the front side for more convenience. Electronic Digital readout of saw unit tilt. Scoring pin with memory reference stop for rapid re-position of the scoring saw to a previous setting. Extra second support for a large sheet. Made in India with best service support & very economical spares. Scoring saw precision lever mechanism for manual adjustment controls of the scoring saw with memory reference stop. Anodised aluminium rip fence with the sliding system on heavy round bar for parallel cutting. The fine setting mechanism allows for precise measurements for parallel cuts. The sturdy frame provides a rigid support for all cutting with the telescopic crosscut fence with aluminium guides for precise and easy positioned. Easy & fast, saw –scoring blades changing. Saw unit vertical movement on precise round guides ensures smooth operation. Its closed structure guarantees high rigidity & a vibration free unit. 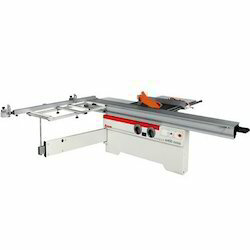 Being a prominent name among the manufacturers and suppliers of the panel saw, we offer SCM Panel Saw. It is manufactured using quality raw materials and latest technology. Furthermore, these products are checked on various quality parameters to ensure its defect-free nature. 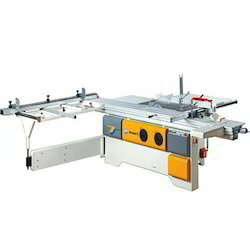 We are leading manufacturer of Sliding Table Panel Saw. Sliding Panel Saws with linear bearing developed with advanced technology, high precision hardened & polished steel bars guides with a multi-chamber system for maximum rigidity of the double roller carriage. This new sliding way provides good performance & assures better accuracy and straightness.